Article: Rio Mangini Had An Unforgettable Time At The Sundance Film Festival Promoting His New Movie! Each and every year, the Sundance Film Festival is always the rave and the trending topic for as long as it runs. So many incredible movies have their premiere at the event and tons of your favorite celebrities are there to celebrate the wonderful world of film-making. 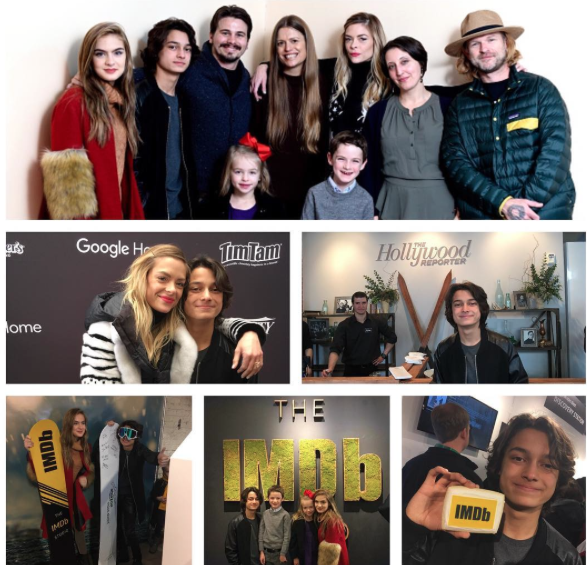 Th magnificent and immensely talented actor, Rio Mangini had a brilliant and unforgettable time as he attended the Sundance Film Festival to promote his new movie with Jaime King, Jason Ritter, Brighton Sharbino, and more. Rio Mangini had an excellent time at the film festival and spent time with his cast-members doing press, hanging out with Variety, IMDB and more. Already, the movie is getting a lot of high praises from critics and has been noted as a movie that everyone needs to watch. As soon as Rio Mangini made his way to Utah, many fans greeted him at the airport as seen in the photo shared below. Rio Mangini shared the terrific photo with his cast as seen below as they had a jam-packed, busy press day. Rio Mangini also shared his excitement over the big day and premiere of his movie at Sundance and reposted the phenomenal photo below. Any and every project that Rio Mangini is a part of is truly an outstanding one and we can’t wait for his new movie to make its way on over to theaters soon. Here at Alexisjoyvipaccess.com, I’d like to send a big congratulations to Rio Mangini on the successful premiere of his movie at the Sundance Film Festival. Check out some more photos of Rio Mangini at Sundance below. Follow Rio Mangini on Twitter and Instagram: @RioMangini and check out our updated VIPAccessEXCLUSIVE interview where he talks about his movie at the Sundance Film Festival. Previous Article: Alex Aiono, Jenna Ortega, Sofia Carson, Kelsea Ballerini, And Jordan Fisher Will Be Hosting The 2017 Radio Disney Music Awards! Next VIPAccessEXCLUSIVE: Alexisjoyvipaccess Attends SKY Diamonds And CNC Motors Inc.’s NHL All Star Party – Recap Here!